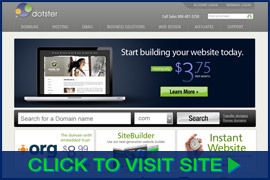 Best known as a domain registrar and alternative to GoDaddy, Dotster is owned by the Endurance International Group, which despite its A- BBB rating, has something of mixed reputation within the web hosting industry. Dotster’s Basic Hosting plan provides a number of unlimited and valuable hosting features for only $3.75 per month for a 1-year hosting term. Better still, it renews at exactly the same rate, and is backed by 24/7 support and a 30-day money-back guarantee. Setting up our test site was easy, and testing showed that they maintained 100% uptime while providing slightly above-average server speeds. Dotster has earned the NCM Online designation of RECOMMENDED. Having had disappointing experiences with shared hosting plans provided by firms known mostly as domain registrars, we did not have high hopes for Dotster. Priced at only $3.75 per month, we were expecting yet another inexpensive but inferior web hosting service. We are pleased to report that we were wrong. Dotster offers three low-cost Linux shared hosting plans — Basic, Deluxe, and Ultra. One-year terms for three renew at $3.75 per month, $9.49 per month, and $13.75 per month respectively. The Basic plan is designed for hosting a single site. It includes unlimited disk space, bandwidth, and subdomains. 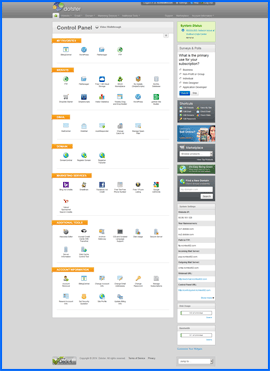 Limited to 1 domain, 5 FTP logins, 10 MySQL databases, and 100 e-mail accounts, it utilizes the vDeck 4 control panel (screenshot below right) and the MOJO Marketplace installer for installing a complete array of available free applications like WordPress, b2evolution, Drupal, Joomla, Cube Cart, PHP-Nuke, and others. The plan is backed by 24/7 phone/chat/e-mail support and a 30-day money-back guarantee. Screenshot of Dotster vDeck 4 control panel. Click to enlarge. The Deluxe plan is designed for hosting multiple sites. It includes all of the Basic plan’s features while adding unlimited domains. It provides 25 FTP logins, 25 MySQL databases, and 250 e-mail accounts. It renews at $9.49 per month, but is presently offered at a discounted rate of $6.75 for the initial hosting term. The Ultra plan is also designed for hosting multiple sites. It includes all of the Deluxe plan’s features while adding unlimited FTP logins, MySQL databases, and e-mail accounts. It also includes Premium Support which provides for a higher level of expedited service by the most experienced technical support representatives as well as a unique toll-free number. All three plans include a free domain name with the coupon code above (first-year only, renews at regular rate of $17.49 per year). None of the shared plans include an SSL certificate for ecommerce functionality. SSL is available for all three plans at an added cost of $59.40 per year. Unfortunately, dedicated IP addresses are not available with any of Dotster’s three shared hosting plans. The sales representative we spoke with indicated that dedicated IP addresses were available with Dotster’s VPS (virtual private server) plans. As is our practice, we purchased the most affordable plan for purposes of testing and reviewing. We selected the Basic plan and proceeded to checkout. 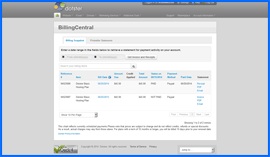 Dotster utilizes a simple 3-step checkout process. Dotster Basic Hosting Plan renewal rates screenshot. Click to enlarge. In Step 1, the purchaser enters a new or existing domain name. In Step 2, the purchaser may select added-cost options. None of the options are required, and none are preselected. In Step 3, a hosting term (1, 2, or 3 years) is selected, and contact and payment information are entered. Step 3 also provides the opportunity to review the Terms of Service, Cancellation Policy, and Privacy Statement. We selected the 1-year term and made our purchase using the PayPal payment option. It is important to note that while many hosting services offer discounted rates for the first term, Dotster is amongst the few whose cheapest plan renews at exactly the same rate — $3.75 per month billed at $45.00 per year (see BillingCentral screenshot above right). 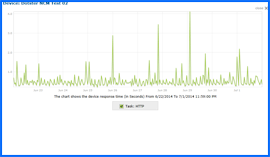 Dotster Uptime Test Results Chart. Click to enlarge. The PayPal receipt and “Dotster Order Confirmation and Login Info” e-mails arrived in our inbox simultaneously — less than two minutes after completing our purchase. The “Getting Started” e-mail arrived three minutes later. It contained a wealth of information relating to our new account including the control panel login, FTP login, nameserver settings, e-mail settings, support contact information, and more. Based on the information contained in the e-mail we were able to upload our test site (click for sample test site) within minutes of completing our hosting purchase. 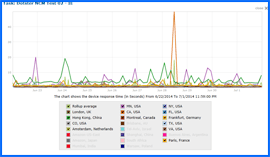 Next we set up the Dotcom Monitor server speed and reliability testing for our new site. All web hosting services reviewed by NCM Online are subjected to 10-day uptime and page-load speed testing. Beginning on 6/22/14 and concluding on 7/1/14, our Dotster-hosted website was checked for uptime and page-load speed every fifteen minutes. Nearly 2,000 individual checks spread across 13 worldwide locations (7 U.S., 6 international) were performed during the 10-day test period. Dotster Speed Test Results Chart. Click to enlarge. We are pleased to report that over the course of the 10-day test period, Dotster compiled a perfect 100% uptime score (see uptime test chart above right). Server speed proved to be above average as page-load speed for our simple 1-page test site averaged 1.5499 seconds for the 946 worldwide location checks performed (see speed test results screenshot right). The results were better for the 7 U.S. locations, averaging 1.2925 seconds to load our test site over the course of the 10 days and 510 page-load speed checks performed. Perfect for cost-conscious small site owners and beginners, Dotster provides easy-to-use and reliable web hosting at a price that’s difficult to beat. Dotster has earned 4.5 stars and is recommended by NCM Online. Cheap website hosting company price comparisons based on 1-year term list price before coupon/promo codes or limited time/introductory offer discounts. These are the renewal rates for the second year of hosting. To ensure that you receive the most affordable Dotster pricing possible, please visit our Web Hosting Coupon Codes page for current discounts and special offers before making any purchases. Dotster provides many advanced solutions for its customers to enrich their brand’s management online. Their premium quality services and products include website hosting, website builders, custom web design, email, domain registration, website security, privacy solutions, and online marketing help. The company’s goal is to offer the services and tools their customers, many who are small to medium businesses, need to be successful in their individual marketplace. They pay close attention to fostering relationships with their clients. Serving millions of customers around the world, their efforts have paid off as they are one of the biggest domain name registrars managing millions of domains every year. The firm has also further responded to its customers’ needs by supplementing its main domain name product with many services that have numerous features and are easy to use. The firm commits to the obligation they have to their clients. Even though they are a large worldwide company, they approach every customer as a smaller caring firm would focus on a small business. Clients recognize the values the company holds true of reliability, flexibility, and simplicity. Dotster constantly responds to the wants and needs of customers. Around the clock support along with a customized, protected web experience has attracted millions to the use of their services. The customer base has only grown and become more loyal over the years as more people understand the one-on-one help and dedication available with the web expert team. A top-of-the-line datacenter is managed by the company’s Certified Network Engineers. Their servers utilize the newest technologies and network design to create a secure and stable online environment for the customers’ businesses. The firm maintains only the highest standards of operation ensuring a dependable and secure webhosting experience. Dotster does not include unwanted advertising in order to ensure customers will upgrade their services. They provide their superior services in the most professional way possible. Their solutions cover every need as they have a tremendous amount of experience serving a wide range of customers over the years. The company can be depended on for a wide variety of services with credibility and expertise that can give customers piece of mind. Dotster is not only dedicated to its customers, but to its environment as well. One of its goals is to become a greener, more sustainable business. They are attempting to achieve this goal by buying renewable energy credits to compensate for 1.5 times the energy consumption their hosting server uses. This means customers too are encouraging renewable energy programs by entrusting their online presence to Dotster. This video tutorial demonstrates the installation of WordPress on an Dotster shared hosting account using the vDeck 4 control panel and the MOJO Marketplace applications installer.